For it’s one, two, three strikes you’re out, at the old ballgame. “Who are you going to root for, Mom, the Tigers or Phillies?” I had my Phillies cap last Friday night when the Detroit Tigers played the Philadelphia Phillies but was forbidden by my family to enter Comerica Park wearing it. I’ve rooted for the Tigers for the 32 years I’ve lived in Michigan, but that’s only because they’re in the American League. I’m a life-long Phillies fan (National League), having grown up an hour away from Philly. As a kid I listened to the Phillies games every night in bed with a little transistor radio glued to my ear. Our family would go to several games a summer, traveling to the big city from the country. Soft pretzels, Philly fries, hoagies, and Philly cheese steaks were all part of the experience. One of my biggest thrills was attending the last game of the 1980 World Series when the Phillies beat the Kansas City Royals. It was a perfect night for baseball on Friday. We were attending as part of a group of Detroit Renaissance District United Methodists. We wanted to park at Central United Methodist Church, one of the first Protestant churches in Michigan, which is right next to the stadium. The lot was already full, but proceeds from parking enable this social justice-oriented congregation to be in mission in the city. As I observed the collective energy and fervor of 42,317 people rooting for the Tigers, I couldn’t help but wonder. Why don’t most churches generate this kind of energy? Why aren’t most of our churches filled to the rafters every Sunday? Would it help if we served peanuts and Crackerjack at our potlucks? 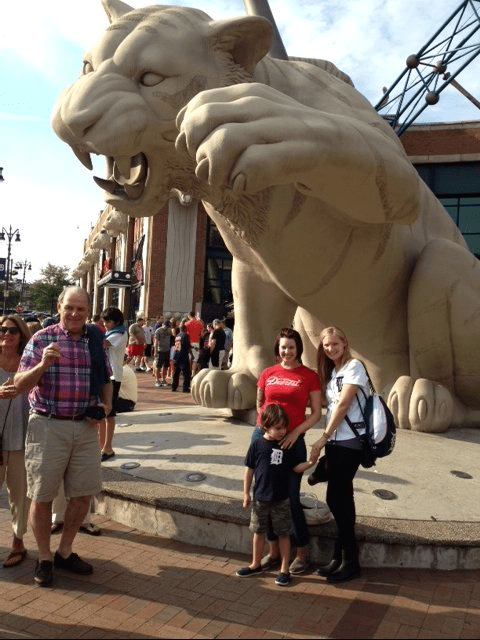 What if the church were like a Tigers game at Comerica Park? The Tigers cater to families. They have kid-friendly food (Little Caesar’s Pizza and Dippin’ Dots among other delicacies), a mascot named PAWS, massive Tiger sculptures all over the stadium, a carousel made up entirely of tigers, and a Ferris wheel with baseball-shaped compartments. How is your church developing age-appropriate ministries, programs, and activities that enable children to grow in their faith? Crazy idea: Do you have a biblical church mascot like PAWS who appears at different events? A camel, ram, sheep, goat, rainbow, or lily? Kids would love it! Comerica Park is a warm, inviting, even boutique-like ballpark. There’s a lot of open space for people to gather, eat, and just hang out. Located in the heart of center city, Comerica Park welcomes all people to enjoy a fun night out. The crowd is very diverse, fans represent the make-up of the community, and there is no dress code. Do you ever imagine what first-time guests might think of your church? How is the space in your church facility configured so that they feel at home? Do you have a gathering area where people can mingle as well as sign up for service opportunities? Crazy idea: Free smiles, coffee, doughnuts, bagels, and copies of the Sunday paper aren’t just for home. Have them available at church, too! It also helps to train members to be welcoming. Technology and music play a key role at Comerica Park in bringing fans together to root, root, root for the home team. The huge screen enables the crowd to view close-up replays. We can also see stats for all the players, and between innings we are entertained by audience participation events, cheers, songs, and waving white rally towels. Is your church taking advantage of technology in worship to enhance sermons, music, announcements, and visual learning? Crazy idea: How about using a large screen to display Twitter comments on the service? Ask the congregation to respond to congregational singing, the pastoral prayer, announcements, and friendliness of ushers, with results projected on the screen. They could even guess how much the offering will be! Comerica Park offers all kinds of logo wear to promote team spirit and loyalty. Every other fan seems to be wearing Tigers apparel. 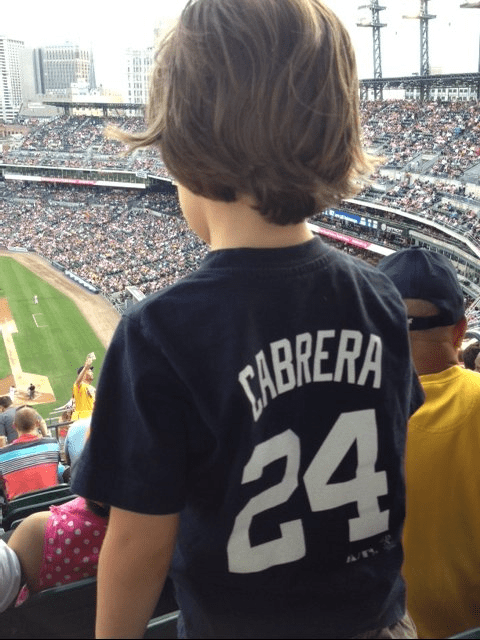 Our grandson, Ezra, is a Miguel Cabrera fan. Crazy idea: Sell logo shirts for clergy and lay staff, who get to pick their favorite numbers, and encourage church members to wear their logo shirts to worship. Of course, don’t forget Jesus, who gets #99 (the last will be first). Tigers fans gladly part with their money through tickets, parking, food, and merchandise because they are proud of their team. The Tigers organization works hard to secure quality players and coaches in order to produce a winning team. In the same way church members eagerly contribute to congregations when they are excited about ministries that are truly making a difference in their community and the world. Need legal help? Dial 1-800-Call Job. Want to cater your next Finance meeting? Call Martha (note: no extra charge for biblical foods). Hungry? Text Little Caesars during the sermon, and they’ll deliver pizza to your car in the church parking lot after worship. One of the electronic signs at Comerica Park displayed this saying: “Success is measured in seasons, not innings.” The reality is that baseball is a very long season with 162 games. No team will win every game, but over time a culture of signing the right players, focus on fundamentals, preparation, and determination will result in success. Remember, when batters succeed three times and fail seven times out of ten at-bats they are considered very good hitters. Failure is the catalyst for improvement. In the same way the church would benefit greatly from thinking long term. Do you have a strategic plan that will lead you into God’s future? Are you willing to sacrifice short-term results for a vision that embraces the length, breadth, height, and depth of God’s love? Crazy idea: Have a plan! Fans respond to excellence. Last place teams do not usually have the best attendance record. So it is in the church. A few faithful will hang in there no matter how listlessly the songs are played, how lost the preacher gets during the sermon, or how tedious the announcements are. The spiritually mature as well as those searching for a church home do not expect to be entertained. However, they do come to worship expecting to hear a word from the Lord and be inspired to respond through faithful obedience. People go to ballgames because they want to be part of something larger than themselves. There’s nothing quite like thousands of people cheering on a team that represents their city and state. The church offers a place where people can become part of building the kingdom of God and where their small contribution toward mission, outreach, education, worship, and fellowship is multiplied many times over when we all serve together. Let the spirit fly free. For it’s one, two, three hymns we sing and out we go. I like it. Crazy idea worship that averages 3 hours and sometimes goes into extra innings? One hour and five minutes, so the stew doesn’t burn won’t cut it. Those who aren’t into sports need an alternative theme, drama or music? This blog was so fun. I could almost imagine myself at the ballgame. I love your ideas about making worship fun. I think we forget sometimes that it’s O.K. to have fun in worship. I look forward every week to your post. Thank You! God Bless You! !